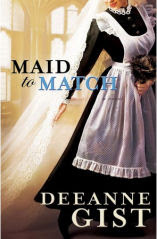 This week, CFBA is introducing Maid to Match written by Deeanne Gist and published by Bethany House. I enjoyed the setting. I enjoyed the ritzy Vanderbilt and romantic Biltmore take (how I would love to visit Biltmore someday)! I enjoyed reading that a lady's maid was certainly not glamorous. I enjoyed knowing what went on below-stairs. However, I was disappointed, once again, by an author's edginess in regards to physical contact. For me, the descriptions between Tillie and Mack - and some of the other servants - were just too detailed and unnecessary. I agree with your review. I love this author's historical research and she's a very talented writer, but the physical descriptions are just a bit much for me. Unfortunately, "edgy" seems to be the new buzz word in the Christian Fiction publishing world. Surely there are more intelligent ways of writing to appeal to a broader audience, but I'm sure many others would disagree.